Library service has been available to area residents since 1737 when the Four Town Library was founded. It served Guilford (of which Madison was then a part), Killingworth, Old Lyme, and Old Saybrook. 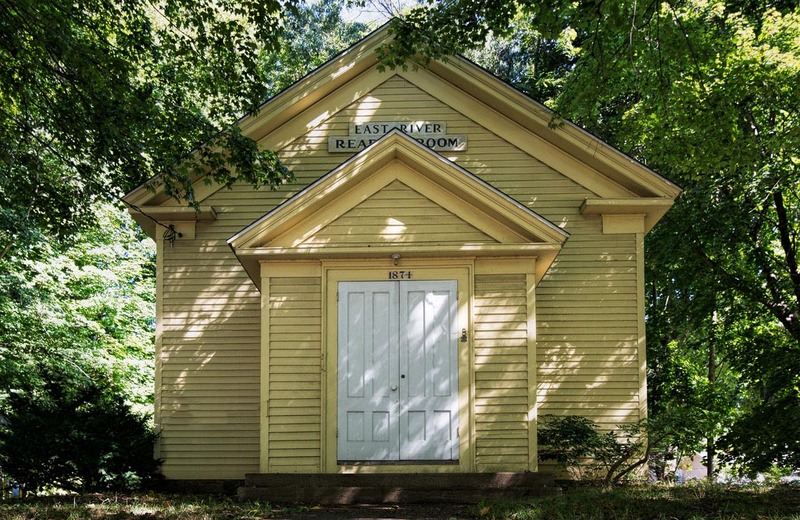 In 1792 a subscription library, known locally as the "Farmers' Library," was established in East Guilford (now Madison); the Reverend John Elliot was the first librarian and the collection was at first kept in his home. Books were lent at a fee of 5 cents per book, and the duration of the loan depended on the number of pages in the book. The 1793 catalog of that library lists about 260 volumes. During the 1860s, interest in the subscription library waned, and its book collection was auctioned off to its members. In 1874 the East River Reading Room opened, and in 1878 the Madison Library Association was organized. Membership in the association was $1 per year, and non-members were welcome to borrow books at a fee of 5 cents per week per book. The collection of 1,000 volumes was kept in such locations as James R. Meigs’ store, Fred T. Dowd’s shoe store, and, finally, the Boston Street School. Here the library was housed from 1883 until 1895--the year in which a fire destroyed both the school and most of the library collection. Only eighteen books, in circulation at the time of the fire, remained. Nonetheless, within a year the Library Association was operating again, with 280 books, in the corner of Mrs. John Wilcox’s shoe store at first and then in a small building on the Boston Post Road. 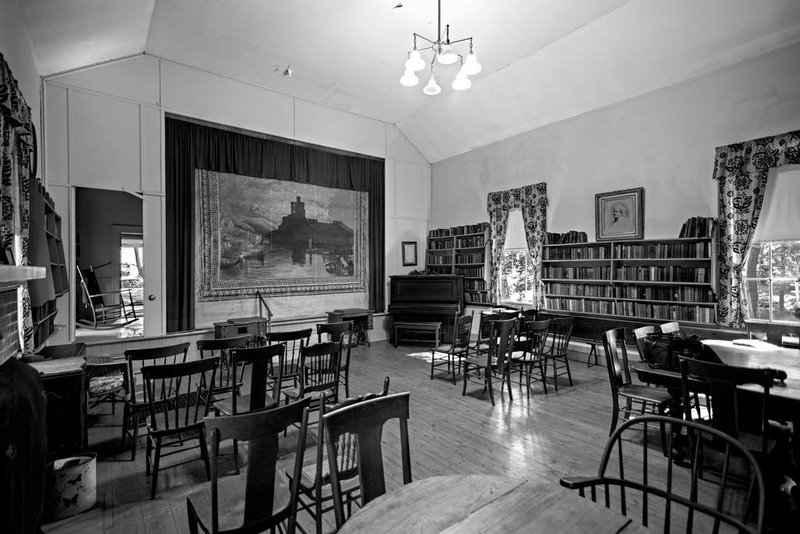 The inadequacies of this situation were resolved in 1900 when Miss Mary Eliza Scranton offered the Association the use of a new, completely furnished library building. She had had the library built, in memory of her father, Erastus Clark Scranton, on the corner of Wall Street, adjoining her family's old home. The original structure, which is the Beaux Arts section at the west end of the present building, was designed by Henry Bacon (1866-1924), an eminent New York architect who, six years later, won the commission to design the Lincoln Memorial in Washington, D.C. He had received his training at the celebrated firm of McKim, Mead and White in New York City and had also traveled abroad to study classical, especially Greek architecture, which became the hallmark of his own work. His specialty became the design of monuments and memorials, which he often did in collaboration with such sculptors as Daniel Chester French and Augustus Saint-Gaudens. The Madison Library Association, had, as one might expect, accepted Miss Scranton’s generous offer, and its collection of 1,100 books was moved in. Opening day was July 21, 1900. The reading room and the circulation department were open from 9 am to 9 pm. The stacks, open to the public for browsing, offered accommodations for up to 10,000 volumes. Miss Mary Eliza Scranton offered the position of librarian to Mary L. Scranton, with the condition that she first acquire the necessary training. 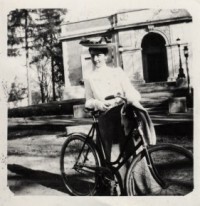 She also paid most of the operating expenses of the library and gave annual gifts of $1,500, a sum that increased slightly through the years until 1913. That year, she established a trust fund of $56,875, the income from which was used to maintain the building. At this time, Miss Scranton also deeded the building and grounds to the E. C. Scranton Memorial Library corporation, which had formed in 1901 when the former Library Association was dissolved. In all, Miss Scranton’s investment in the library exceeded $2 million in today’s dollars. 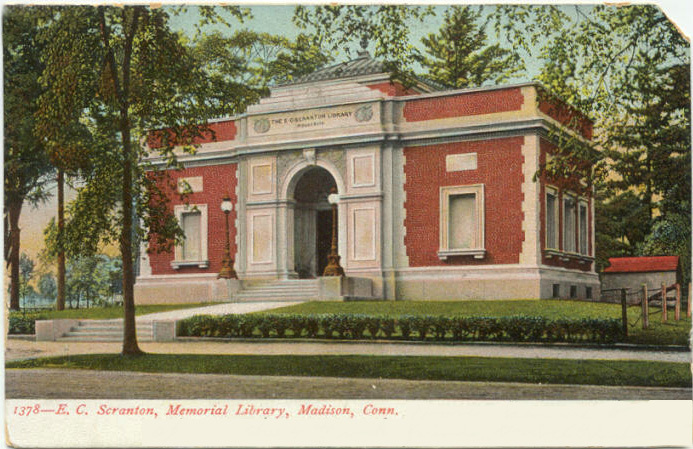 The town of Madison, in 1900, had declared the library association to be a free town library, open to all Madison citizens, and had agreed to contribute $100 annually for its expenses. The Scranton Library is, by declaration of the Connecticut State legislature, Madison's designated free public library. The fact that the building is not owned by the town and the employees are not town employees is not unusual in Connecticut. Miss Evelyn Merriwether and Miss Charlotte Poirot were among the head librarians in the decades between 1900 and 1960. By the 1960s the building had become outmoded and crowded. The book collection had swelled from the original 1000-plus volumes to about 40,000 in 1965. To meet the demands of a rapidly growing population, the board successfully raised $126,195.00 for the renovation of the original building and the addition of a two-story wing. More than $100,000 of this amount were private donations. The state granted the library $12,500, and the remaining $12,000 came from library reserve funds. In 1971 the Library Board, in its request for support from the town to bring the collection up to state standards by 1975, pledged to raise a minimum of one-third of the annual book budget through its own efforts. Fund-raising initiatives such as an annual Library Ball, an annual Book Fund Drive, and, later, a community-wide Parade of Parties dramatically increased the library's collection of 115,000 items, overseen today by Library Director Beth Crowley. In 2008 the Library Board presented to Madison citizens a detailed proposal for another expansion of the library to meet the demands of the twenty-first century. A Town of Madison referendum on November 4, 2008, asked voters to approve a maximum expenditure by the Town of $13.3 million, which represented 75% of the projected costs. The Library had agreed to be responsible for 25% of the total cost. Alas, the citizens of Madison voted against the expansion. Happily, in February 2017, a wide majority of Madison voters approved a revised building plan that offers a greatly enhanced campus-style approach to the library. The new design will both preserve and link several notable historic buildings. The citizens of Madison look forward to expanded services and handsome and practical spaces that will meet the needs of the community. Credit: This history of the E. C. Scranton Memorial Library was prepared by the library staff and supplemented with details from A Brief History of Madison, Conn. by Katherine Hulser Ryerson (New York: Pageant Press, 1960).